I really love the fabric and embroidery. It’s too warm to use currently in the south but I look forward to using it once it cools off a bit. The only issue I have had is that when I fluffed it in the dryer, it left a brownish hue on the white thread. It may have stayed too close to the heating element so be weary of using your dryer if it’s not large capacity. Overall it seems to be well made and a good price. I’d definitely recommend. Tropical Plantation Embroidered Cotton Comforter Set provides a classic, traditional damask embroidery on top of a solid grey background for simple, elegant comfort. 100-percent cotton shell with embroidery, oversized. Imported. Machine washable. Very satisfied with the fabric and look of the comforter set; purchased it for my daughter who is at college and she loves it. This was the perfect bedding for a beach condo rental we have in Florida. Warm, but not too heavy, and serene colors that match our decor. I would recommend. Looks great on the bed. Shams, too. Not too heavy. Pleased with purchase. 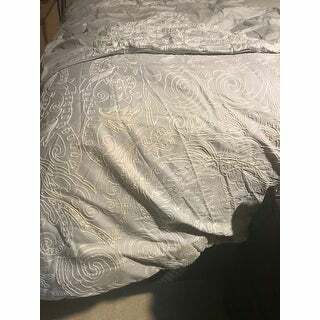 I love this bedding...great quality and looks expensive. "Hello Question it says it is a three pice item but when you read it it only says it comes with two items. What is the third piece? Thank you Tracy "